Ohio's Northcoast Happenings - From Cleveland, Ohio to the Lake Erie Islands! Concerts, Events, Places, People, Restaurants, Real Estate, Financing, Movies, Businesses, Community, Green Eco News, and more. Cleveland Ohio West, Western Medina, Lorain, Northern Erie and Northern Ottawa County to Ohio's Lake Erie Islands. 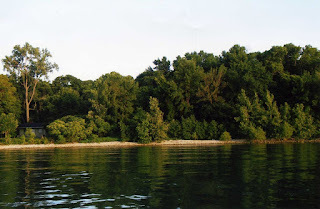 North Bass Island also called Isle St. George, is a wonderful island in Lake Erie. Owned largely by the state, North bass has fewer than 20 residents. Of the island's 688 acres, the state of Ohio owns 589 acres. Although sparsely populated, North Bass (also called Isle St. George) has a paved airstrip, small state owned marina, a church, a mail box with regular mail pick-up, a former school now used as a community center, and an active social culture. Winter ice fishing is popular, and islanders make regular trips to the Village of Put-in-Bay on South Bass Island for groceries, socializing and entertainment or to Middle Bass Island for a quick meal at J. F. Walleyes. Old Christmas trees and branches mark the snow mobile trails over the Lake Erie ice in the winter. The Hisey Group, LLC with Real Living Realty One currently has 3 beautiful wooded parcels for sale on North Bass Island. All three are waterfront parcels. For info call: 440-315-6000 or email lee.hisey@realliving.com. Cleveland Area Leading Real Estate Rebound?? Ohio Colleges Going Green !! LAKE ERIE ISLAND REAL ESTATE AND EVENT NEWSLETTER: GET UPDATES!